Just before Christmas I was sent a wonderful book to review, a collection of the first five novels of The Wizrd of Oz stories. Now I'll admit this is something I've not read before, of course I have watched the films but this was when I was a child, not like now when I much prefer to read the books before I view the movies. The cover immediately pulls you in. Leatherbound and a beautifully bright yellow a homage to the yellow brick road and with very classic looking illustrations appearing on it. Some of the drawings are printed in metallics and even the title itself glitters, already giving a real magical feel to the book you are holding. 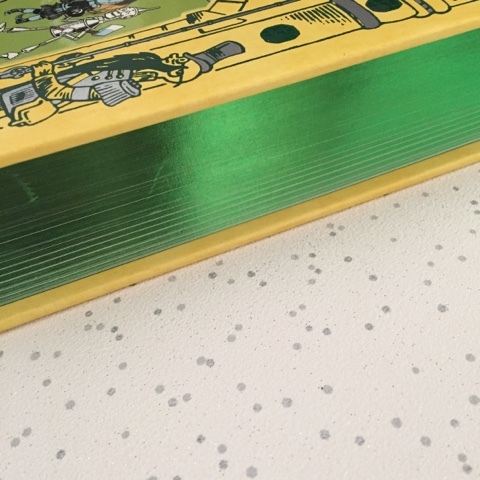 The edges of the pages are leafed in a sort of metallic green colouring, perhaps relating to that wicked witch who we know will make an appearance. There is also an attached green bookmark ready to save your place. The stories within are : The Wonderful Wizard of Oz, The Marvelous Land of Oz, Ozma of Oz, Dorothy and the Wizard in Oz and The Road to Oz. All were written by L. Frank Baum. I didn't realise how old these stories actually were. With the original publication date for The Wonderful Wizard of Oz being 1900. Shows how wonderful these stories must be to keep going through the ages. 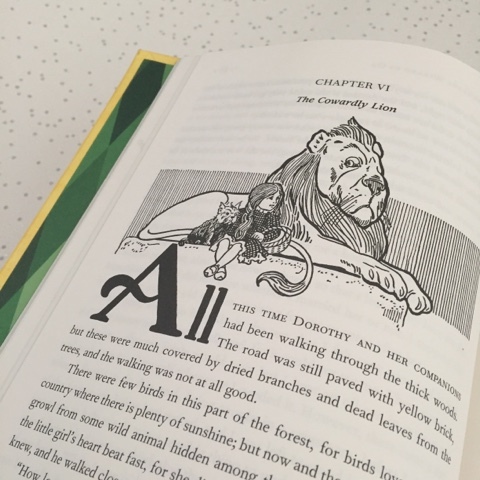 Inside you will discover mystical worlds and extrordinary creatures along with much loved characters such as the Cowardly Lion and Dorothy Gale. The stories themselves are relatively short, around about 150 pages each and because everyone is broken down into managable chapters, you forget about the daunting size of the overall book itself. Brought alive by cleverly placed black and grey illustrations you are given the tools to really imagine the land of Oz and all it contains. Each story made sure to have appearances from characters previously mentioned as well as managing to include new faces that seemed to fit in with ease. I think the mix of new and old kept the stories from getting stale. 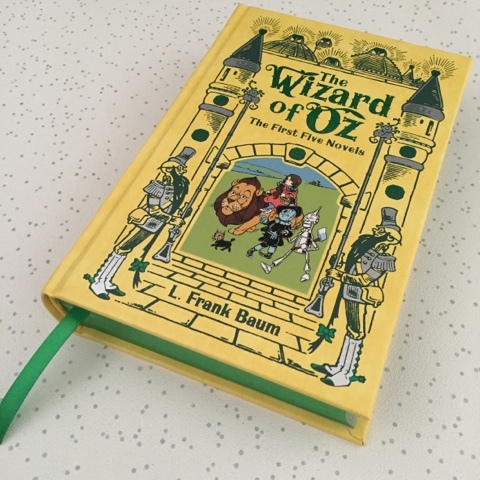 L. Frank Baum set out to write something different to the traditional fairytales, creating magical creatures of his own invention like the famous Munchkins. I think he most definitely achieved this. These are a set of stories that resonate with the older generation, a classic to look back on but they are also stories that will win the hearts of the younger generations to come. Classic tales like this and Alice's Adventures in Wonderland are where the idea of magical realms transpired from. I think without stories like these characters such as Harry Potter wouldn't exist. I love the green edging on this book! To me The Wizard of Oz is a film, not a book and I've never thought of reading the stories. This book does look lovely, the black and white illustrations are especially appealing to me. What a beautiful book! I've never read the stories too, in fact if asked I'd have only said there was one book. I think H would like this. This looks stunning! I've never read the book before either. I was thinking the green of the pages might be to do with the Emerald Palace. These look like such pretty books and you can't beat the Wizard of Oz. My daughter loves Wizard of Oz based on the movie and a ladybird version. Very keen to read her the proper version, and this looks like a good one to have on our bookshelves. It has an old fashioned feel to it that I love I did not know there was so much to the Wizard of Oz!